Besides some interesting shapes and technical improvements, tents aren’t a place that we usually look for innovative and artistic design. They are usually designed like most outdoorsy tents that you would find at your local REI and consists of one or two basic, uninteresting colors. The folks over at Fieldcandy have decided that simply being able to choose whether your tent is blue or green doesn’t really cut it when it comes to design, so they made it their mission to bring some much-needed personality and artistic sensibility to the functional tent. 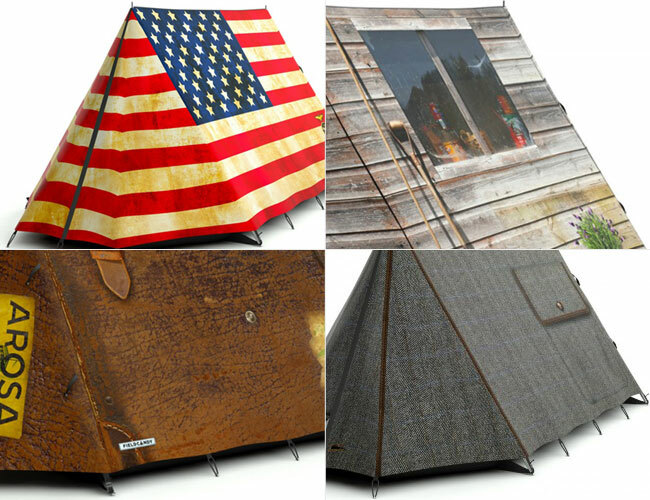 The tents ($400+) all have the same basic design, which consists of a cotton inner tent, the printed (and waterproof) flysheet, as well as a groundsheet and of course your basic poles and pegs for setting up. Based on the idea that your tent should say something about you, the tents come in a wide variety of creative and artistic designs. Every design is a limited edition, but the company is constantly putting up new designs, both fun and classic. The tents are all the same size and will sleep two people comfortably, but are said to be significantly more spacious than standard two-person tents so you might be able to squeeze a third in there. Not every tent suits our fancy, but the options for blending into your surroundings (see the grass or cabin-like versions) or boldly standing out (celestial patterns or leopard print) are nearly endless. The only hard part would be choosing just which design to purchase.